Vesta is one of the largest asteroids in our Solar System and has been the subject of study by JPL’s Dawn mission. 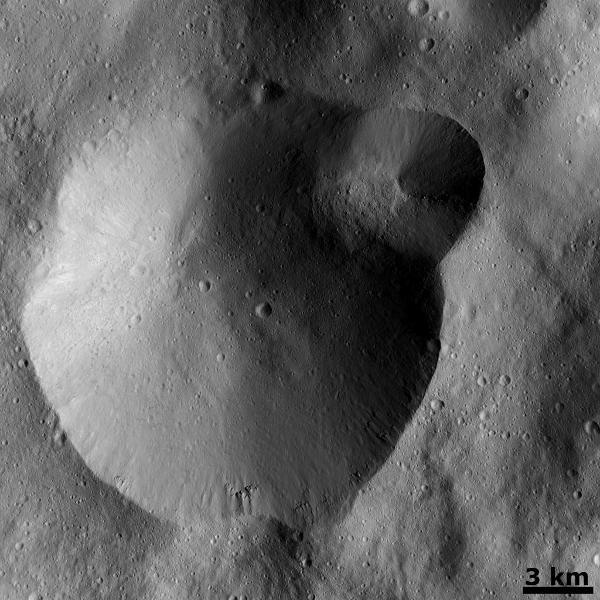 The surface of Vesta is pockmarked with impact craters. The two pictured above range from about 20 kilometers and 6 kilometers in diameter and are found in Vesta’s Urbinia quadrangle. This image was taken by NASA’s Dawn spacecraft, through the clear filter of its framing camera on December 18, 2011. Dawn was about 260 kilometers from the surface and in the low-altitude mapping orbit phase of its mission mission to study this asteroid Vesta and the dwarf planet Ceres.